For the jobsite or a home workshop, Bosch and DeWalt make the top portable table saws. For woodworking pros, however, it's tough to beat SawStop's performance and safety. We also name some great performing, wallet-friendly alternatives for homeowners and pros on a budget. Specs that Matter Rip capacity – 25" Maximum cut depth -- 3.125" Weight -- 60 lbs. 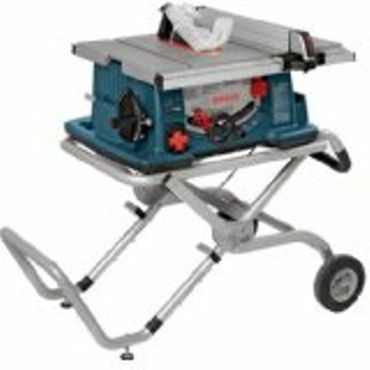 If you need a table saw that can travel, the Bosch 4100-09 consistently earns high marks. Reviewers praise its power, accuracy, easy setup, and easy blade changes. They also love the gravity-rise wheeled stand, which rolls smoothly and snaps open or folds flat in a single lever-activated motion. Finally, they appreciate the convenience of the blade guard system, complete with riving knife and anti-kickback pawls. Specs that Matter Rip capacity – 20" Maximum cut depth -- 3.125" Weight -- 45 lbs. 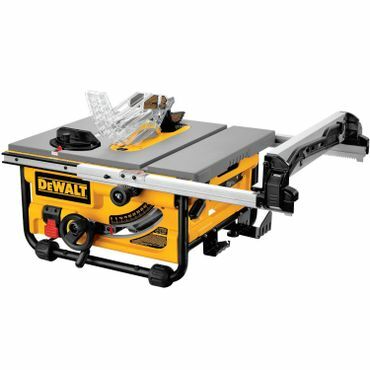 For carpentry projects or as a starter saw, the DeWalt DW745 receives solid reviews. Though it doesn't have the capacity of the Bosch, owners say it's well made and easy to adjust. The rack-and-pinion fence earns kudos for accuracy. The saw weighs just 45 pounds and can even be hung on a workshop wall for storage; an optional is also available. The three-year warranty is another plus. Specs that Matter Rip capacity – 36" Maximum cut depth -- 3.125" Weight -- 310 lbs. The SawStop Contractor Saw CNS175-TGP36 stands out chiefly on account of its unique safety brake, which stops the spinning blade dead when it senses the presence of skin. However, it's also an excellent saw in other respects: powerful, well built, and easy to assemble, with great dust collection and loads of features. Cost is a major concern, but so is the cost of the injuries SawStop is designed to eliminate. Specs that Matter Rip capacity – 30" Maximum cut depth -- 3.25" Weight -- 267 lbs. It's not really a great choice for professional woodworkers, but for home do-it-yourself users looking for a more than competent contractor saw for their workshop, the Ridgid R4512 is a terrific value. It lacks the SawStop's safety features, but comes in at less than a third of its price. Build quality is first rate, most users say, with a cast iron table that does good job of damping down vibration. Users add that it cuts smoothly and accurately. Specs that Matter Rip capacity – 36" Maximum cut depth -- 3.125" Weight -- 408 lbs. For the woodworking professional, the 3-horsepower SawStop Professional Cabinet Saw PCS31230-TGP236 is the top pick. Its superior safety features include an excellent riving knife and blade guard system and a unique flesh-sensing blade brake to prevent cuts. Reviewers also praise its performance, exceptional dust control, and overall ease of use. Less expensive versions with 1.75-hp motors are also available (Est. $2,300 and up). The warranty is two years for the saw and five for the motor. Table saws cut more or less the same way as a circular saw (covered in their own report): a round blade, usually 10 inches in diameter, spins as it works its way through the wood. The main difference is that the blade is fixed in place, sticking up through a gap in the table, and the operator moves the wood past the blade instead of moving the saw itself. 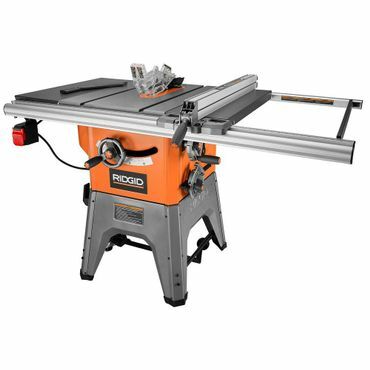 Table saws support and guide lumber and wood panels as they pass over the spinning blade, making it easier to make accurate repeat cuts than with a circular saw. Reviewers recommend these models for easy transport to jobsites and for easy storage in a small workshop. Portable table saws come in two types. 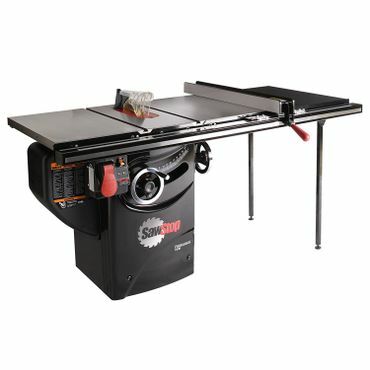 Benchtop saws sit on top of a workbench and are light enough to pick up and carry; jobsite saws are mounted on folding stands, usually with wheels for easier transport. The main drawbacks of a portable saw are its lower power and smaller table, which makes it tricky to cut larger lumber and sheet material such as plywood. Prices for portable saws start at less than $200, but the best-rated models typically cost $300 or more. Standard table saws are also called contractor table saws, even if they're really intended for the home do-it-yourselfer. 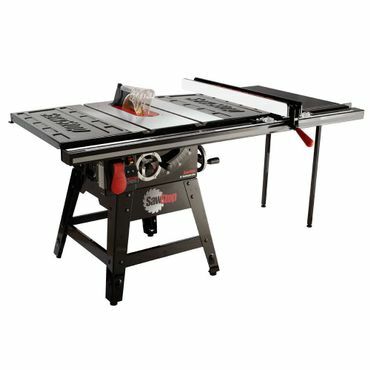 These table saws have open, fixed legs, and they take up more space than a portable or benchtop table saw. They're also heavier – weighing as much as 200 to 300 pounds. On the plus side, their tables are often larger, making it easier to cut 4 by 8-foot panels of plywood or sheetrock. Prices for contractor saws range from around $600 to nearly $2,000. If you are a woodworking professional, you'll want a cabinet saw in your workshop. These are the heaviest, sturdiest and most precise table saws, with powerful motors that require a 220-volt electrical outlet. Cabinet saws require a large, dedicated space because of their guide rails and large tables (often with big extension wings). Then also tend to have the best safety and dust-control features. Woodworkers with enough space (and money) usually make a cabinet saw the permanent centerpiece of their workshop, though a few cabinet saws have mobile bases. Cabinet saws cost $1,600 and up. The main differences between saws of the same type lie in their power and accuracy. More powerful saws can handle thicker or denser wood, cut faster, and run all day without wearing out the motor. Accuracy depends on a variety of factors: low vibration, meticulous build, and an accurate fence and miter gauge that are easy to set. Table saws can pose a serious risk of injury, since part of the spinning blade comes up above the surface of the table where it can come into contact with the user's hand as it guides the wood. Thanks to voluntary safety standards introduced by Underwriters Laboratories (UL) in 2007, pretty much all table saws now come with blade guards that minimize the risk. Modern guard systems are easier to remove and replace as needed – an important feature because inconvenient blade guards are apt to be left off the saw. Today's table saws also include riving knives, which ride up and down with the blade when its height is changed, rather than splitters that are fixed in place. The problem with the old splitters was that they had to be removed for certain types of cuts, and users might forget to put them back on before making rip cuts. This increased the risk of kickback injuries, which occur when the spinning blade kicks back a piece of wood toward the user with tremendous force, causing serious injury to any part of the body that's hit. Blade guards and riving knives can't prevent all injuries, though. A 2011 report from the Consumer Product Safety Commission (CPSC) found that 20 percent of all table saw injuries were caused by saws with riving knives, and 25 percent were from saws that had their blade guards in place. The latest advance in table saw safety is a feature that stops the spinning blade when it senses the presence of tissue, such as a finger or forearm. A company called SawStop was the first to offer this technology, and currently, it holds the exclusive right to sell saws with this feature in the United States. (Bosch introduced a portable table saw with blade-stopping technology in 2016, but was forced to take it off the market after a successful patent-infringement suit by SawStop.) In 2017, the CPSC proposed a new rule to make SawStop's technology mandatory on all table saws, but that rule is still under review. See the Buying Guide for more information. "Best Portable Jobsite Table Saw Shootout!" To make our recommendations for the best table saws, and the best table saw bargains, we consulted comparison tests and single-product reviews in tool-related publications such as Pro Tool Reviews, Woodworker's Journal, Popular Mechanics, Tools of the Trade, and Fine Homebuilding. Many of these reports are several years old, but most of the models tested are still available. Most professional reviews focus on portable table saws, but we found a few that cover contractor and cabinet saws. To learn about how table saws perform in real people's homes, we consulted owner-written reviews at retail sites like Amazon, Home Depot, Lowe's, and Sears. User reviewers don't have the breadth of experience that many experts enjoy, but they can provide keen insights on the model they bought, including things that might not crop up in the relatively short time professional reviewers have to spend with a given saw. We take all of this feedback into consideration in naming our top picks for portable, contractor, and cabinet table saws. Selections are made based on a table saw's cutting performance, accuracy, ease-of-use, features and durability.